Chatter - a sound that is from the throat and often associated with a very quick fast movement of their lower jaw. It is most commonly made when a cat is excited about its prey – either outside or looking out the window. They often make this sound while stalking and just prior to attacking their prey. Hiss – a sharp sound similar to the sound of spraying a can of compressed air. It is often used to communicate immediate disapproval or dissatisfaction with a situation, or if they feel threatened. An example might be when another cat gets too close. The hiss says, “Back off!” Cats are territorial, but also very civilized and will usually give enemies more than one chance to get away once they have asserted their ground. In the wild, they rarely “fight to the death,” but rather will fight to defend themselves. Purr – a vibration that seems to come from the throat area, although experts disagree about its source and meaning. The sound varies in tone and intensity, and can take on different meanings. Most commonly it is believed to be an expression of satisfaction, happiness, or contentment. However, cats will also purr when they are sick, afraid, or in pain. In these cases, it is believed to be a method of self-healing or self-comfort. Meow – a sound often distinct to each cat, and may be the most versatile form of language they have. Cats will use different meows for different moods and different purposes. It is usually for attention, whether as a warning or request or plaintive plea, they can mean anything from, “check this out,” to “please pet me,” to “are you ever getting out of bed - the sun is up and I’m hungry!” A quick meow can be a greeting when you enter a room, “You’re back!” A long, loud, plaintive meow can indicate extreme longing or even pain. 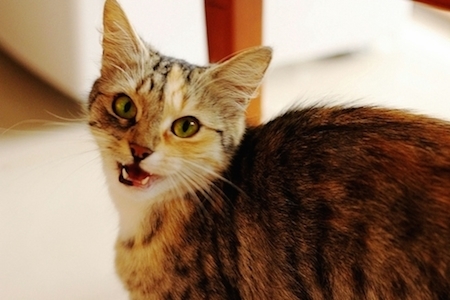 By listening to your cat’s vocalizations and addressing his or her needs, you will learn “catspeak,” too. What does your cat do to get your attention? Also, check out this cute video of The Two Talking Cats!